If you've reported the car accident to your insurance company, chances are that a person from the insurance company will try to get in touch with you. Even if you haven't reported the car accident, there's a good chance that a person from an insurance company will want to interview you about the car accident. These people from the car insurance company are called insurance adjusters, or field adjusters. Their job is to collect as much data and information as possible about the car accident so the insurance company can understand what your case is all about so they can budget your case. This budget is called a " reserve". If your case is not "reserved" properly by the insurance company, it may present some barriers towards getting fair compensation in a timely manner down the road. Some insurance adjusters are very aggressive and will do everything in their power to meet with you as soon as possible. They will call you relentlessly until you pick up the phone and answer their questions. They will insist on getting a statement from you. They will come unannounced to your hospital room or to your home to get a statement from you or your family. It's as if these adjusters are paid by the statement, and by the timeliness in which their statements are gathered (and it wouldn't surprise me if some were!). Let's set the record straight: You're under no obligation to speak with, communicate with, or meet with any insurance adjuster until you have a personal injury lawyer . We recommend that nobody communicate with the insurance adjuster at all, and to leave all communications between you and the insurance company to your lawyer. 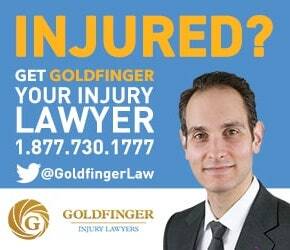 Goldfinger Injury Lawyers has seen countless cases dissolve on because of accident victims and their families communicating too early with adjusters without the assistance of a personal injury lawyer. This is probably the first time you've had to deal with a car accident. You don't know how the process works. In contrast, the adjuster from the insurance company does this for a living, and has probably been handling car accident claims for years and years. Who do you think knows more about how the process works, how the law works, and what tricks to play to make sure the insurance company's best interests are protected? Insurance adjusters have their company's best interest in mind, not yours. Despite what they may tell you, their role is not to represent you or look out for your rights. They are employees working for, or indirectly working indirectly for the insurance company. Experienced insurance adjusters are very talented. They know that you attract more bees with honey than with vinegar. So, if an insurance adjuster is being really nice to you and your family, there's probably a good reason for it. And there's probably some information they really want to dig out from you to ensure that the exposure and liability of their employer is limited. They will do everything in their power to make their case stronger, and your case weaker, no matter the nature of the accident or injury; so beware and don't speak with these people without an experienced personal injury lawyer.